Local family owned. 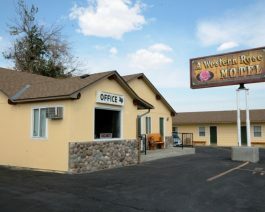 Located downtown Cody, within walking distance of all the shops and restaurants. Currently ranked in the Top 10 on TripAdvisor. All rooms are one level, non smoking with TV, AC/Heat, FREE WIFI, coffee makers and mini fridges. Guest laundry available. Open May-September. No Pets and no food is served at this property.